I have reached the point where I have so many books in my office, I need to clean house and donate them to my local library. 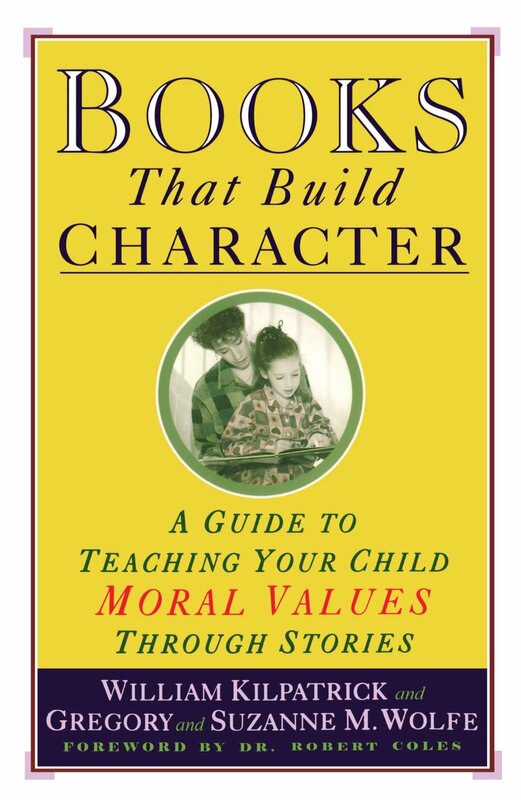 As I lovingly went through the mounds of books, I ran across Books That Build Character: A Guide to Teaching Your Child Moral Values Through Stories. I read it a long time bout but what William Kilpatrick and Gregory and Suzanne Wolfe teach in their remarkable book is just as significant today as it was when I first read through it. In a word the lessons it teaches are timeless. In the early pages, the authors tell a story of four-year-old Crystal, who, when her two-year-old sister began to cry, quickly assessed the situation. “She wants her Dogger,” Crystal declared, referring to a missing stuffed bear. Unprompted, Crystal offered one of her own stuffed bears as a substitute. The evils that we confront, abortion and euthanasia/physician-assisted suicide, are intertwined like the two strands of DNA. They have colonized the imaginations of all-too-many Americans. The encouraging news is that this almost nonchalant acceptance of these attacks on vulnerable human beings can be found in the mental file cabinets of fewer and fewer Americans. Why? Because the cabinets are not locked. Indeed, the drawers are open and the contents, yellow with age, are crumbling. Ask yourself this. Why, 18 years into the 21st century, is the pro-life movement still growing, becoming better organized, and closer than ever to carrying the day? Why are pollsters time and time again finding increasing resistance to unabridged, unbridled, and unchecked abortion on demand? I would not pretend to have the answer. For starters, there is no one answer, of course. However, I would hazard to guess that had the body politic been hooked up to an EKG, the machine would have shown that our hearts missed a beat when, way back when, we first learned about the insanity known as partial-birth abortions. Prepackaged answers about “choice” and “rights” and “blobs of tissue” couldn’t hold a candle to the unvarnished truth: that it requires verbal gymnastics of Orwellian proportions to disguise the truth that partial-birth abortion is akin to infanticide. We are now gradually making inroads into the public’s consciousness (and conscience) about the truth that unborn babies can and do experience pain–and about the horrific nature of dismemberment abortions. For me, looking ahead to all the challenges of this year and beyond, the panicky reaction of the Abortion Industry and the relentless introduction of pro-life legislation is very reassuring. Moreover, the fundamental decency that is an essential component of the American character still lives. People were–and continue to be–moved by the atrocity that is abortion. After over 45 years of darkness, the light refuses to be extinguished. It would, of course, be much too simplistic to suggest that by merely telling stories of virtue, Americans could be persuaded to chuck the evasive platitudes that pass for pro-death argumentation. Yet never forget that truth-telling–what we do at NRL News Today and NRL News–does have an impact. Sometimes it is subtle, sometimes overt, but pro-lifers have kept the flame burning by never allowing the moral dimension of the fight for life to be obscured. No matter what the New York Times says (or fails to say), you do care about both mother and unborn child. No matter what the Washington Post prints (or fails to print), our “values” are not “outdated” or “anachronistic.” No matter what the major networks air (and don’t air), we are not motivated by “fear of the future” but embrace a future where legal protection is enjoyed by all. Compassion, love, devotion, mercy, a fearless championing of the weak and the powerless–these are not mere “values” that come and go, but virtues, qualities of character which stand forever. Virtues are the sterner stuff out of which we create our moral imagination. This richer, deeper, broader vision enables us to incorporate for ourselves “how people can act when they’re at their best,” to quote again from Books That Build Character. The outgrowth is a kind of highly developed peripheral vision which enables pro-lifers to “see” suffering and injustice where others–staring straight ahead– see nothing. Let me conclude with a thought that came out of a conversation I had years and years ago with pro-life Congressman Chris Smith–my personal hero. Ever humble, Chris remarked to me that there are those of us whose work on behalf of the little ones has garnered us more praise and recognition than we deserve, which is 100% true. But one day we will receive our eternal rewards. And at the very front of the line, Chris said, will be all of you–those millions of unsung grassroots pro-lifers whose decades of devotion have gone largely unnoticed. If Chris is right, and I am utterly convinced that he is, then Someone of unsurpassed importance has been watching all along. He knows what you are doing on behalf of His little ones. And that, my pro-life brothers and sisters, is the ultimate recognition.